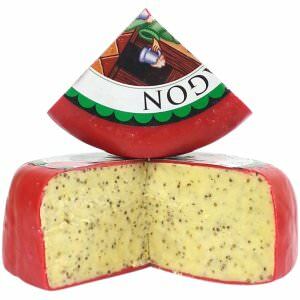 Red Dragon is a smooth, firm, tasty cheddar cheese made with Welsh brown ale and wholegrain mustard seeds, coated in a bright red wax. This gourmet cheese is buttery and has plenty of bite, but is not overly hot. 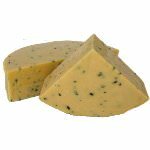 The addition of the ale makes the cheese nicely moist and tangy and the mustard seeds add a subtle sharpness to a traditional cheddar. 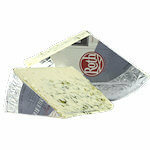 Red Dragon is made from pasteurized cow's milk and aged for 3 months. Many people like mustard as a condiment for cheese, now it is offered to you, all-in-one. Serve as a table cheese, melt in on your sandwich with dark ale or try a strong red wine. Ingredients: Cheddar cheese (pasteurized cow's milk, salt, starter culture, vegetarian rennet), wholegrain mustard (water, mustard seeds, malt vinegar, salt, sugar, herbs (tarragon, cumin, dill seed, garlic powder, turmeric, coriander, cinnamon, bay leaf, cloves, back pepper)), ale, mustard bran, mustard flour.